He is too young to be a historical figure, but he is also too important to leave out of history. Billy Peek is a St. Louis institution, a living legend who writes the history of his city with the music he plays on his guitar. He learned his craft listening to St. Louis blues musicians, including Albert King, Ike Turner, and the great Chuck Berry. Then he went on to international recognition as a rock and roll musician for his work with Rod Stewart’s band. But wherever Billy Peek goes, he takes a little of St. Louis with him in the hard-driving, boogie-woogie rock and roll that he says “tells a story and tells it in overdrive”. “I grew up on a street called Tower Grove”, he explains when asked about his origins as a musician, adding that “ it was a good environment to grow up in to finally become a rock and roll musician, because it had all the background that it needed to give that good time feeling.” Tower Grove Avenue between Chouteau and Vandeventer formed the main corridor through “The Grove,” a south side working-class neighborhood where Peek grew up in the 1940s and 1950s. Like many people in the neighborhood, his parents had migrated from southeast Missouri during World War II to look for work in the foundries, warehouses and slaughterhouses along the Frisco Railroad tracks. Peek’s father worked in a nearby tobacco warehouse, and his mother was employed by a meatpacking firm. They worked hard all day, and at night they relaxed to the sounds of country music singers, like Ernest Tubb, Hank Williams and Red Foley, coming from the radio and juke-boxes around town. Eventually they opened up a neighborhood bar featuring live country-and-western music, the Peek-A-Boo Inn. Billy Peek learned to play country music from his father, but his neighborhood provided him with other resources. At Adams Elementary School and Roosevelt High School he met people who would remain his friends for life. One summer when he was a teenager, all of his friends got Mohawk haircuts and formed a club called the Mohawks, of which Billy was President. “Nobody’s parents were too pleased with that” he remembers, but it was the kind of neighborhood where everyone stuck together and everyone felt a part of something. One day at a corner ice cream parlor, at the age of 15, Billy ran into the hippest guy in the neighborhood, the one who was always “in the know” before anyone else. Snapping his fingers and wearing an Ivy League cap, he motioned Billy over to the jukebox and said “Hey man, wait ‘till you hear this.” He played Chuck Berry’s “Maybelline,” and it changed Billy Peek’s life. “I liked what I heard immediately,” he remembers. From that moment on, Peek vowed to make his living playing rock and roll. He practiced for hours in his room, trying to emulate the sounds he heard on records and the radio. As a teenager, he went to black night clubs to hear performances by local musicians including Ike Turner, at the Club Imperial in north St. Louis, and he went over to East St. Louis to the Midtown Country Club, the Apollo Club, the Palladium, and the Plantation to hear Little Milton and Albert King. At the age of 15, Peek formed his own band and also performed with others. At the age of 18, on Tuesday nights he would sit in with Ike Turner’s band and play the “Okie Dokie Stomp” to show off his skill. As a white teenager trying to make an impression playing with a black band, Peek would play the song twice as fast as Ike Turner did, a demonstration that won applause from the crowd but which caused more than a little grumbling on the part of Turner’s drummer who hated to have to play that fast. Like many other white teenagers, Billy Peek listened to disc jockeys Dave Dixon on KATZ and Jesse “Spider” Burks on KXLW to hear blues and rock and roll. He learned the language of the blues and tried it out on his guitar, the one-string runs of BB King, the bottleneck sound of Elmore James, and the 8/8 time rolling bass boogie-woogie of Muddy Waters that became the subtext of American rock and roll. But the most important influence on Peek remained Chuck Berry. Three years after he heard “Maybelline” in that corner ice cream parlor, Billy Peek played on the bill at a show featuring Chuck Berry. Peek had previously pulled off a successful appearance on Russ Carter’s “St. Louis Hop”, and as a result was chosen to appear on that program’s first anniversary show, at the Casa Loma Ballroom on Iowa near Cherokee in south St. Louis. Peek was the opening act, and was careful not to steal the headliners thunder, so he played no Chuck Berry songs that night. But he did meet his hero and get his autograph, which was thrilling enough. Peek worked at the Terrace Lounge on the DeBaliviere strip, playing his entire repertoire of rock and roll songs, but doing especially well with Chuck Berry’s material. One night late in 1963, while playing a string of Chuck Berry songs at the Terrace Lounge, Berry strolled in and Peek noticed Berry sitting in the audience. Fearful of offending his idol, Peek steered clear of any more of Berry’s compositions that evening, but at the end of the show Berry came up, congratulated him on his playing, and invited him to perform at Berry’s club, Berry Park on Sunday afternoons in Wentzville. Peek played some Ray Charles, a few BB King numbers, a little of Jimmy Reed’s tunes, and nearly everything ever done by Chuck Berry. Sometimes Berry would sit in with Peek’s group and they would play together. The years at Berry Park enabled Billy Peek to get close to Chuck Berry, musically and personally, and that association later led to a European tour during which Peek played in Berry’s backup band. In 1973, Billy Peek backed up Chuck Berry on a tour of Europe, and he began to see that he could hold his own with guitarists from all over the world. They played together again on an awards show honoring Berry’s induction into the rock and roll Hall of Fame, and shortly after that in 1975, on a television show “Rock Concert.” Rod Stewart happened to see that show with his guitarist Ron Wood, and Wood suggested that Peek would be perfect for the new band that Stewart intended to form. Rod Stewart called and setup an audition a few months later. When Billy Peek auditioned for Rod Stewart, he drew upon all that he had learned growing up in the Grove. Stewart asked him to listen to one of the tracks they had recorded and to play whatever came into his head. Stewart stayed in the control booth with his head phones on. The song which had been giving the rest of the band difficulty, turned out to be “The Wild Side Of Life”, originally a Hank Thompson country song from 1952. Peek remembered the song as a favorite of his father’s, one that he had heard around the house incessantly when he was growing up. Billy laid down a hard driving Chuck Berry-style rhythm underneath the melody, and when he saw Rod Stewart jump in the air and practically hit the ceiling of the control booth yelling, “That’s It! That’s It! That’s exactly what I want!” he knew he had the job. With Billy Peek’s guitar helping to set the pace, the Rod Stewart Group became one of the best-selling musical aggregations in the world over the next five years. 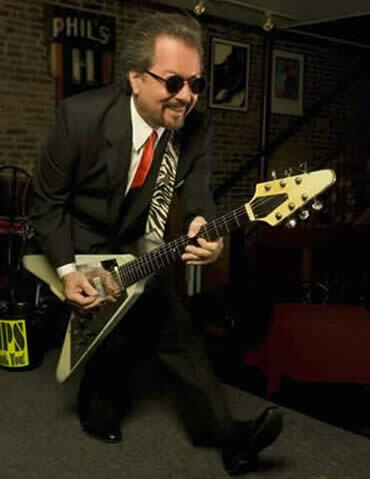 Billy Peek’s guitar solos on “Better Off Dead,” “Blondes Have More Fun,” “Ball Trap,” “Wild Side Of Life,” “Big Bayou,” “She Won’t Dance With Me,” “Born Loose” and “Hot Legs” anchored the band in the traditional rock-and-roll style that provided an effective contrast to Stewart’s pop vocalizing. But Peek secured his place in that band through more than technique alone; his entire life history had prepared him for that role. Other musicians could play the same notes, but Peek “had the feel” of the music, a feel he acquired through hard experience in the 1950s.